In 1914 34-year old Robert Walton Goelet held sway over a vast real estate empire. His was one of New York’s oldest and most prominent families and for generations the Goelets had accumulated real estate, ever holding firm the family imperative never to sell property. His father and uncle, Robert and Ogden Goelet, had inherited and further amassed holdings equaled only by the Astor family. On March 10, 1886 the brothers had acquired property from the Estate of Montague M. Hendricks on Fifth Avenue between 35th and 36th Streets. Five years later, on June 2, they purchased the adjoining lot from Thomas Scott. The combined corner plot at Nos. 402-404 Fifth Avenue was in the most exclusive area of the city—two blocks north of the William B. and John Jacob Astor mansions, and one block north of the palatial white marble Alexander T. Stewart house. To the possible disgruntlement of the wealthy neighbors, the brothers had three small commercial buildings erected on the site. Construction began in 1889 and was completed a year later. The combined hotel and boarding house was one of the first hints of the intrusion of commerce onto the residential avenue. A year later the Goelets hired McKim, Mead & White to remodel the structures into a banquet hall for the Louis Sherry’s exclusive catering and restaurant business. Sherry’s was, along with Delmonico’s, a favorite among Manhattan’s wealthiest socialites. 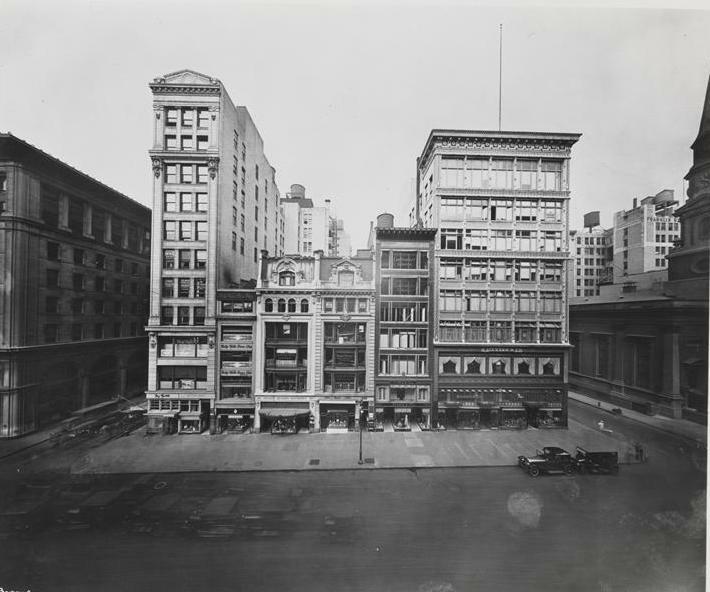 But by now, in 1914, when Robert W. Goelet owned the property, Fifth Avenue had changed. Directly across the street was the white marble palazzo of Tiffany & Co. and just to the south was B. Altman’s elegant department store. The grand Waldorf-Astoria Hotel sat on the site of the Astor mansions. 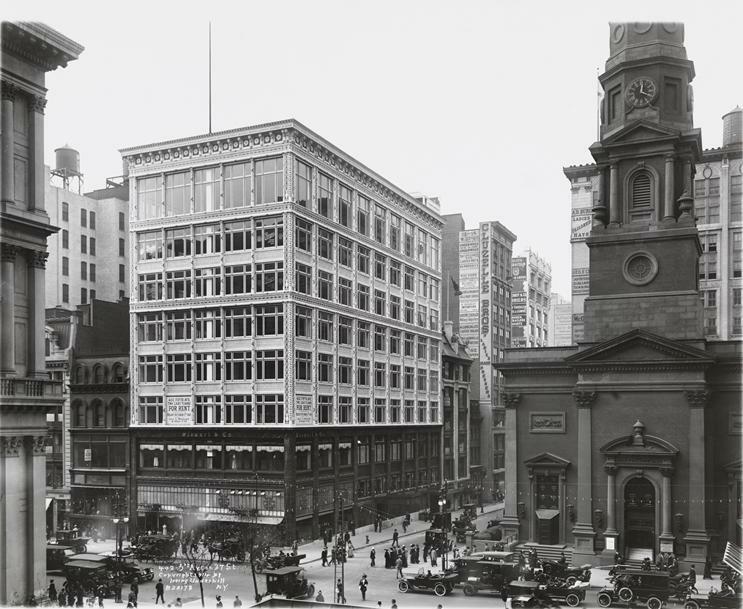 Commerce had undeniably arrived on Fifth Avenue, albeit in a dignified and high-class manner. Stewart & Co., dealers in women’s apparel like “fancy suits” and “crepe de chine dresses for afternoon and evening wear,” was doing business from the former Sherry’s location. Goelet’s mother was the former Harriette Louise Warren and her brother was, conveniently for Robert, architect Whitney Warren. Robert called upon his uncle to replace Nos. 402-404 with an upscale store and loft building. Warren’s firm, Warren & Wetmore, produced one of the most intriguing structures along the avenue by planting one foot in 18th century England and the other firmly in Edwardian Chicago. The architects’ eight-story building drew heavily on the Chicago School of Architecture by using expanses of what are termed “Chicago windows.” The triparitite openings are comprised of a large, central pane flanked by two narrow one-over-one double hung windows. Thin colunnettes between the openings rose pencil-like to the overhanging cornice. Above the two stories of retail space, the modern age took a back seat to English neoclassicism. Warren & Wetmore joined with the New York Terra Cotta Company to face the building in Josiah Wedgwood-inspired panels. The delicate blue and white tiles--reminiscent of Wedgwood’s famous jasper ware pottery--featured classical urns and laurel wreaths. The colunnettes were bundles of reeds in terra cotta, fastened together with crossties. The cornice was a lush, yet delicate, celebration of neoclassical designs. Built by George A. Fuller & Company, most remembered by New Yorkers for its headquarters now known as the Flatiron Building, the structure went up with amazing speed. Construction began on July 8, 1914 and was completed only five months later, on December28, at a cost of $250,000. The street level housed two large retail spaces. Stewart & Co. returned, taking the southern space (and giving the building its name in the process); and Mark Cross, a manufacturer and merchant of expensive leather goods, took the northern corner storefront. For the next fourteen years Stewart & Co. would cater to well-heeled women, offering items like a “lovely evening wrap for the matron,” as advertised in October 1915. In 1927, two years after the store merged with Arnold, Constable & Co., Stewart & Co. gave its support to the Actor’s Fund of America. On November 28 five actresses worked as saleswomen, much to the amusement and interest of shoppers. The New York Times reported that “Those who will help sell feminine apparel today are Hazel Dawn, Mary Daniels, Josephine Drake, Vivian Tobin and Polly Walker.” Ten percent of the store’s sales that week was donated to the organization. In 1929 the store moved uptown to Fifth Avenue and 56th Street. In the meantime Mark Cross sold its wide array of high quality items. Among the products advertised In March 1920 were a leather “motor case” fitted with white celluloid toilet articles, a folding writing pad and stationery box with compartments for stationery (made of glazed calfskin leather), and a pigskin bag for men with a leather lining. No sooner had Stewart & Co. moved out than Emily Shops, Inc. moved in. By now Mark Cross Company held the lease on the entire building from Robert W. Goelet and continued to occupy its corner space. Emily Shops, “a chain specializing in frocks and sportswear for women, according to The Times, agreed to pay Mark Cross $150,000 per year. Although Mark Cross moved out of the building in 1935 when it opened its new store at Fifth Avenue and 52nd Street, Emily Shops stayed on into the 1950s. The spacious upper floors were home to a variety of business throughout the 20th century. Gage Brothers & Co., milliners, had been among the original tenants and would remain through mid-century. The building was a favorite among jewelers like watch manufacturer Wittnauer who leased space for two decades, Longines Watch Company, and jewelry manufacturer Swank. Publishing firms like Conde Nast publication and Ballantine Books also made the Stewart Building home during the middle decades of the 20th century. I worked @ 404 Fifth Avenue for a year under the building management staff. Building was owned by Silverstein and Sons. My dad worked for them, managing the building staffs of their properties. When I was there the tenants that I remember were: Robert Fiance Beauty School on the 2nd floor; Seiko on the 5th floor (I think), a photography studio/agency had 2 floors, 6 and 7 and the 8th floor was the Fifth Avenue Racquet Club, a squash club. If anyone remembers the name of the photo studio I'd appreciate if you would post it. Thanks.